Motto: "The most exciting place to live." Boring is an unincorporated community in Clackamas County, Oregon, United States. It is located along Oregon Route 212 in the foothills of the Cascade mountain range, approximately twelve miles (19 km) southeast of Portland. The Boring Lava Field, which lies between Portland and Boring, took its namesake after the town. Named after William Harrison Boring, a former Union soldier and farmer who settled the area in 1874, Boring was officially platted as a railroad town in 1903 after the Portland Railway, Light and Power Company constructed a line to the area. The former railway is now part of the Springwater Corridor, a rail trail which begins in Boring and ends at the Eastbank Esplanade along the Willamette River in southeast Portland. After the town's establishment, it became a major logging community prior to and during World War I due to the abundance of timber in the area. In addition to logging, plant nurseries and agriculture have also historically been major economic forces in the town. In 2012, the town was paired as a sister city to the village of Dull, Scotland, United Kingdom, and to Bland, New South Wales, Australia in 2013 due to their unusual names. The land on which Boring was built was a former lava field. The Boring Lava Field, which takes its namesake from the town, is located just north of Boring. There are approximately 80 lava vents across the area, remnants of the volcanic activity that occurred there roughly 2.6 million years ago. The lava field extends across surrounding Portland and Vancouver, Washington, though the volcanic centers are extinct. The land that would later become Boring had no known inhabitants, though the Clackamas Tribe had a camp located south of Boring, near present-day Oregon City, along the Willamette River. By 1855, the remaining members of the tribe had relocated to the Grand Ronde. Settlers began to arrive in the Oregon Territory in mid-1800s, after the establishment of Portland. The town took its name from William H. Boring, a Civil War veteran and pioneer. 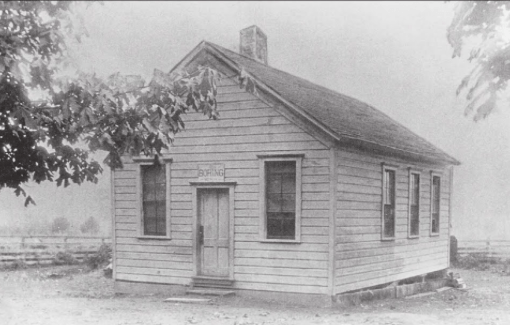 Boring was given its namesake after William H. Boring, an Illinois-native and early resident who began farming there in 1874, and subsequently donated land for the community's first schoolhouse to be built. 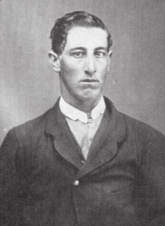 He was a Union veteran who had moved to Oregon after having fought in the Siege of Vicksburg during the Civil War. William's half-brother, Joseph, had settled in the area in 1856 prior to his arrival. William Boring died in 1932 at the age of 91 and was buried beside his wife Sarah in Damascus Pioneer Cemetery. Boring station on the Portland Railway, Light and Power Company line, ca. 1904. Boring was platted in 1903 as "Boring Junction" after the construction of a railway line by the Portland Railway, Light and Power Company. The post office was established and named "Boring" the same year, and the builders of the interurban railway adopted Boring as the name of the community. 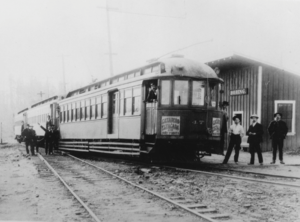 An electric trolley operated on the railroad line to Portland, Oregon and Gresham, which began boarding passengers in 1905. The electric trolley severely cut travel time to and from the city; horse and buggy travel from Boring to Portland took an average of six hours, while a trip to Portland via the trolley system took only one hour. Though younger students in the area attended a local school built on Richey Road, high school students in Boring commuted via trolley to Gresham and Portland to attend high schools there. The early residents of the area post-settlement were mainly German and Swedish immigrants. After World War II and the prominence of automobile ownership, the trolley ceased passenger operations to Portland, but continued to travel between Boring and Gresham. The railway went defunct in the following years, and was incorporated as part of the Springwater Corridor, a rail trail that begins in Boring and ends at the Eastbank Esplanade in downtown Portland. 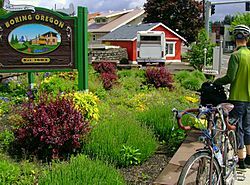 In 2005, citizens of Boring applied to become one of the first legally recognized villages in Oregon. However, after many months of polarizing debate on the village issue, residents narrowly defeated the village designation in a town hall referendum in August 2006, with 293 votes in favor and 298 against. The unusual name of the town often prompts its inclusion on lists of unusual place names. The name "Boring" is embraced by locals, however, and found in many local businesses, resulting in many road signs that seem humorous to outsiders. Boosters of the village designation use the slogan "The most exciting place to live." In June 2012, in a play on the town's name, the Boring Community Planning Organization voted to "pair" with Dull, Scotland, for the purpose of promoting tourism in both towns. Dull is a tiny village of only 84 residents, while Boring has about 8,000. In 2013, a farm community and former gold prospecting site Bland Shire in West Wyalong, New South Wales, Australia was added to the mix to create not a "twinned town" relationship but a "League of Extraordinary Communities" grouping Dull, Boring and Bland as a means of encouraging travel, promoting all three communities. The same month, construction of the Boring Station Trailhead Park was completed on the empty lot that once housed the original 1903 train station, and opened to the public. Aerial view of Boring and Damascus, with Mount Hood in the background. 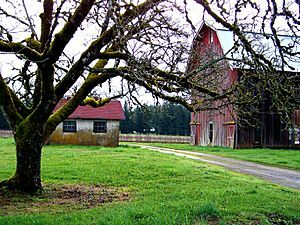 Located at the northernmost end of the eastern Willamette Valley, Boring rests in the foothills of the Cascade mountain range, at the base of Mount Hood. The town is approximately 31 miles (50 km) from Government Camp, a major resort and skiing community on Mount Hood. The town comprises approximately 30 square miles (78 km2) of Clackamas County. Boring is part of the Portland metropolitan area, located approximately 12 miles (19 km) southeast of the Portland city limits, and 16 miles (26 km) from downtown Portland. The town's landscape is hilly, with its elevation ranging between 548 feet (167 m) and 755 feet (230 m). Several creeks run west through the city limits into the Clackamas River, including Doane Creek, North Fork Deep Creek, and Tickle Creek. According to the Köppen climate classification, Boring has a Mediterranean climate, characterized by warm summers and chilly, rainy winters. The town receives an annual average of 54.26 inches (1,378.2 mm) of rain—significantly more than neighboring Portland, which averages 36.03 inches (915.2 mm), or Gresham, which averages 44.85 inches (1,139.2). 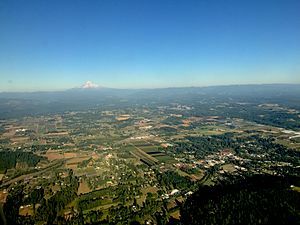 Boring's high volume of rainfall can be attributed to its location in the Cascade foothills, which situates it at a considerably higher elevation than other towns and cities in the Portland metropolitan area. The first frost in Boring typically occurs within the first week of November, while the last is typically in the first week of April. According to the 2010 U.S. census, the town population was 7,726, in 2,875 households. This was a significant drop from the 2000 census, which had reported a population of 12,851. The current population density is 261 inhabitants per square mile (100.8/km2). Males make up 50.50% of the population, while females make up 49.50%. 90.65% of the town's residents were white, 0.06% black, 2.43% Asian, 0.23% Native American, and 2.71% identified as "other." 7.5% of the population identifies as Hispanic or Latino. As of 2010, the largest ancestry groups in the town are German (22.3%), English (14.0%), Irish (10.4%), and Swedish (5.5%). The median age in the town was 48.2, and 78% of households comprised a married couple living together. 29% of residents were college educated with a bachelor's degree. According to 2012 data, the median household income in Boring is $73,208, while the per capita income is $28,438. 32.20% of households earned under $50,000 annually, while 39.80% earned between $50,000–$100,000. According to the Portland Business Journal, Boring is considered one of the wealthier zip codes in the Portland area. 28% of the community's annual household median incomes exceed $100,000. As of June 2016, the unemployment rate was 3.98%. 86.8% of residents are property owners, while 13.2% are renters. The eponymous fictional town of the Disney TV series Gravity Falls is inspired by Boring. In 2013, the town was home to an event hosted by Vitaminwater, in a series in which the company gave Boring and the town of Normal, Illinois, "makeovers". The event featured musical performances by Santigold, Matt & Kim, and Yung Skeeter, as well as standup comedy performances which included Amy Schumer. The town was the subject of a 2016 promotional documentary short by Brooklyn, New York-based cinematographer Adam McDaid for Ogilvy & Mather. Elizabeth Leighton of Aberfeldy, Scotland, proposed the town's pairing with the village of Dull, Scotland, while passing through Boring on a cycling holiday. In June 2012, Boring accepted the proposal of Dull to "pair" their municipalities, in an effort to promote tourism in both places as a play on their names. The Boring Community Planning Organization issued commemorative "Boring & Dull: a pair for the ages" T-shirts and mugs, as well as raffling off a trip to Dull, Scotland. However, the Boring CPO will not be attempting to get the pairing recognised by Sister Cities International. Dull and Boring celebrations are held annually on 9 August in Oregon with a piper and a barbershop quartet; the Dull celebrations are in October. After their pairing, August 9 was declared by the State of Oregon as "Boring and Dull Day" across the state. In 2013, the rural Australian town of Bland also twinned with the two cities, as a lighthearted way to embrace the community's name. Fern Hill School in Boring, ca. 1883. Two teenagers picking berries on a berry farm in Boring, 1946. Boring, Oregon Facts for Kids. Kiddle Encyclopedia.